Chorizo is a term encompassing several types of pork sausage originating from the Iberian Peninsula. 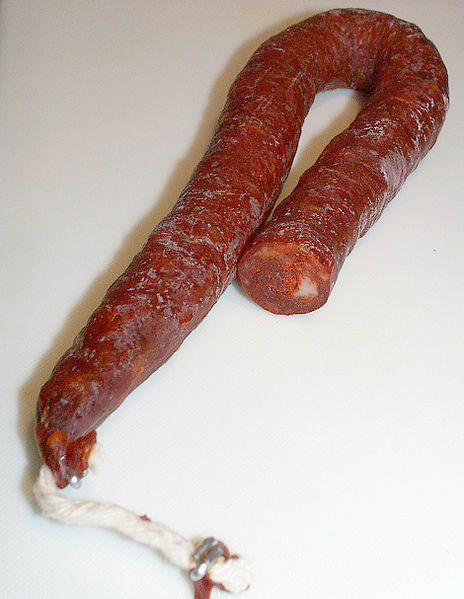 Chorizo can be a fresh sausage, in which case it must be cooked, but in Europe it is more frequently a fermented cured smoked sausage, in which case it is usually sliced and eaten without cooking. Spanish chorizo and Portuguese chouriço get their distinctive smokiness and deep red color from dried smoked red peppers. Mexican chorizo usually has the consistency of ground beef, though drier, due to the high chili powder content. 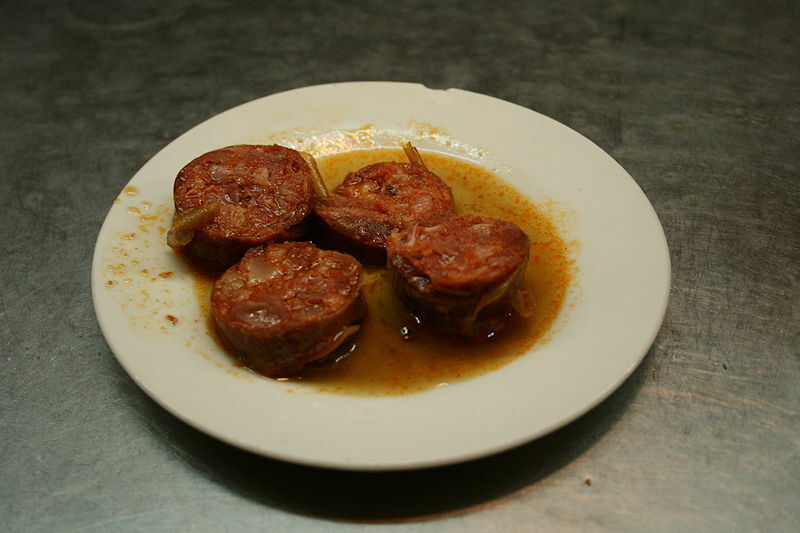 Left: Chorizo sausage slowly cooked in wine or cider is common Spanish tapas. Spanish chorizo is made from coarsely chopped pork and pork fat, seasoned with smoked pimentón (paprika) and salt. It is generally classed as either picante (spicy) or dulce (sweet), depending upon the type of smoked paprika used. There are hundreds of regional varieties of Spanish chorizo, both smoked and unsmoked, which may contain garlic, herbs and other ingredients. Chorizo comes in short, long, hard and soft varieties, some of which are suited to being eaten as an appetizer or tapas, whereas others are better suited to cooking. Leaner varieties are typically better suited to tapas, eaten at room temperature, whereas fattier versions are generally used for cooking. A general rule of thumb is that long, thin chorizos are sweeter and short chorizos are spicy, although this is not always the case.